To Whom Do These Arms Belong? Looking more closely, the memorial is done in the form of a hatchment, and contains the arms of Cressy (the second and third quarters of the Rosebery arms), which are blazoned in Burke's General Armory as: Argent a lion rampant double-queued sable armed and langued gules. On the scroll below the shield I can mostly make out the first two words of the Rosebery motto, Fide et, though the remainder (which should be fiduciâ) has been much worn away, leaving us with the letters duc alone remaining legible. 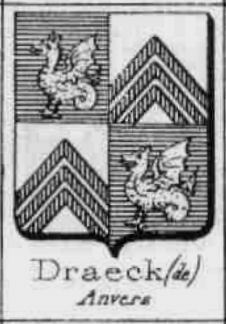 The Cressy arms came into the Primrose family when Archibald, 1st Earl of Rosebery, married (in 1691) Dorothea, only child of Everingham Cressy, of Birkin, Yorkshire. The two crests, one atop the helmet within the hatchment and the other on the pediment above the hatchment, are both the Primrose crest, A demi-lion gules holding in the dexter paw a primrose or (though the forepaw on the demi-lion on the pediment is extremely anemic). It is definitely not the Cressy crest, which is variously given as Out of a ducal coronet or a demi-peacock proper or Out of a ducal coronet or a demi-eagle proper. See what I mean about anemic? The Primrose crest also appears on a corbel stone on display at the church, as well as an earl's coronet. What a beautifully carved crest and coronet! 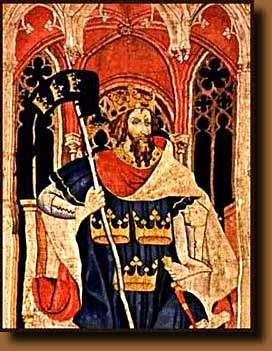 The carved achievement of arms in the center, and the framed embroidered arms to the left, are those of Primrose, Earl of Rosebery. The arms are blazoned: Quarterly: 1 and 4, Vert three primroses within a double tressure flory counter-flory or (Primrose); 2 and 3, Argent a lion rampant double-queued sable (Cressy). 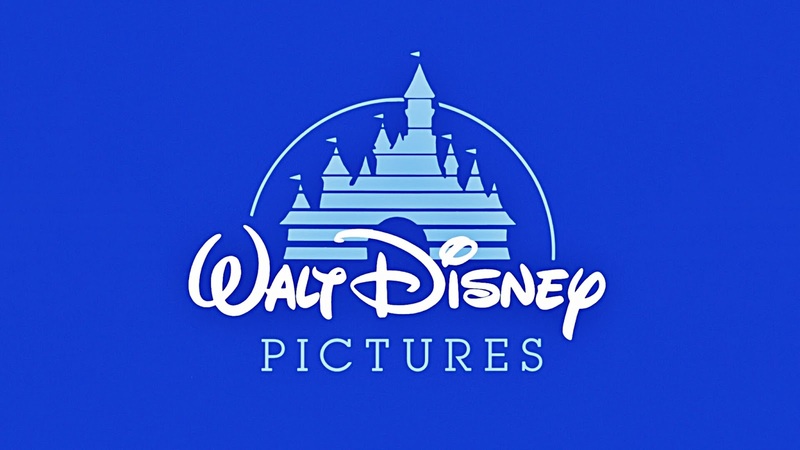 Not shown in either of the depictions here is the crest, A demi-lion gules holding in the dexter paw a primrose or. The supporters are Two lions or, and the motto Fide et fiduciâ (By fidelity and confidence). Ah, there's nothing quite like having your arms prominently on display for everyone whoever visits the church to see. When Is An "Improvement" Not Necessarily An Improvement? I ran across an article on the internet recently that talked about graphic designer Vladan Pavlovic and his proposed a new visual identity for the Republic of Serbia. He wanted to explore how a new visual identity could change the perception people have of Serbia, both at home and abroad, and that would present the country as one of "peace, democracy and tolerance". 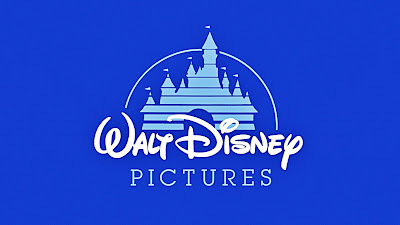 I don't know that I'd go that far in describing it, but it's a well-done design, simple, clear, and readily recognizable. Indeed, Pavlovic claims his proposed design (for arms and banner) abides by the five principles of good flag design as outlined by the North American Vexillological Association, which advises that the pattern should be so simple that a child can draw it from memory. So far, so good. 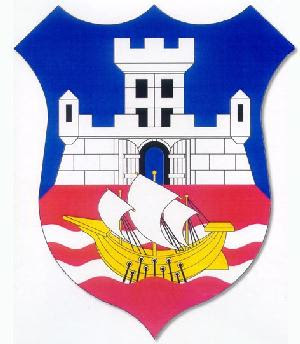 But, then he also revised the coat of arms (dating to 1931, below) for the city of Belgrade. 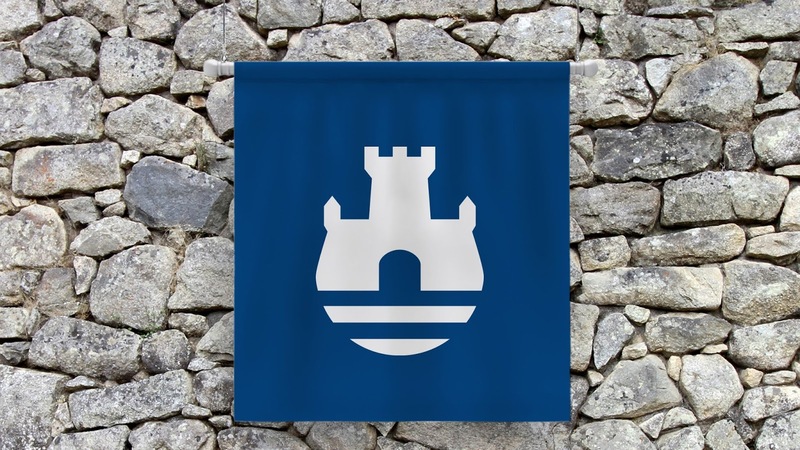 Pavlovic's design reduces the number of elements in the coat of arms, which centers on the city's Kalemegdan fortress, with lines beneath symbolising the intersecting Danube and Sava rivers, and also reduces the number of colors to just two - eliminating the red ground used to symbolise blood spilled in battle over the course of the city's history, because he believes it has strong "negative associations". No, they're really not all that much alike. And yet, I cannot see his proposed design without thinking of this last one. It's funny, sometimes, how you'll see something and it will just make a connection in your mind to something that you hadn't thought about much before. 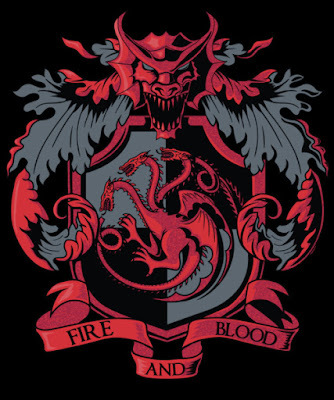 In this specific case, it had been pointed out to me that one of the on-line tee shirt shops was offering a couple of heraldry-like designs for a currently-popular cable TV series. So I went out to look to see what they had, and then it struck me. These are what we call "attributed arms!" And the Three Magi, or Wise Men, who visited the infant Jesus have coats of arms ascribed to them. I don't know why, all of a sudden, this time it forcefully struck me that these new, 21st Century designs could also be considered to be attributed arms, but it did. 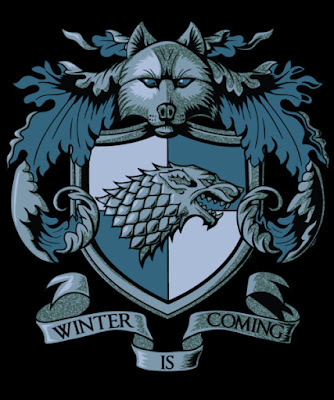 I wonder if the designer/artist has any idea he/she is following a centuries-long tradition of creating arms for people and entities who didn't, for whatever reason, have heraldry of their own? It's always interesting, visiting an art and/or antique store I've never been to before, because you just never know what you're going to find. We've been looking lately for a painting or other art piece to go over the television in the living room. We're taking our time with it, because whatever we get we're going to be looking at for a long time. But our tastes are pretty similar, and we're pretty sure that when we see "it," we'll know. It's clearly a large (I'm afraid a little too large to do well in our living room, but we were a little tempted by it anyway) memorial board. We were told that it came from a French church, but there wasn't a lot more they could tell us about it besides the (hefty) price. I thought to myself that, given that it appears to be the shields of a husband and wife who are pretty clearly of the nobility, it shouldn't be all that hard to track down whom this board memorializes. It turns out, I was only partially correct. The coronet appears to be that of a baron of The Netherlands. The supporters are two griffins or, armed and langued gules. The motto is Crux decus spes (Cross honor hope). (A slightly different motto, Crux decus et spes, was borne by Gerard du Demaine, per the Dictionnaire Des Devises Historiques Et Héraldiques, Vol 1.) The date of death at the bottom is 12 November 1885. Draeck (de) Anvers, Gand - (Barons, 18 mai 1782. M[aison]. ét[einte].). Écartelé: aux 1 et 4, d'azur, à un dragon ailé et écaillé d'or (de Draeck); aux 2 et 3, d'argent, à trois chevrons de gueules (de Wesele dit Sompecqui). Cimier le dragon. Supports deux dragons ailés et écaillés d'or lampassés de gueules. My attempt at a translation into English makes it: Draeck (de) Antwerp, Ghent (Barons, 18 May 1782. [Literally, House off. I assume that means the de Draeck line had died out by the late 1800s.] Quarterly: 1 and 4, Azure a dragon [which the English would blazon a wyvern] winged and scaled or (de Draeck); 2 and 3, Argent three chevrons gules (de Wesele known as Sompecqui). Crest: A dragon as in the arms. Supporters: Two dragons winged and scaled or langued gules. Esmez (Bretagne) De gueules, à six billettes d'argent. Mauger (Normandie) De gueules, à six billettes d'argent. Périchou de Kerversau (Bretagne) De gueules, à six billettes d'argent. 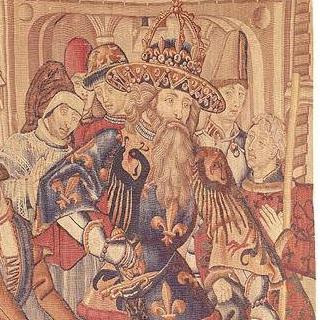 Not all that helpful, especially since the three entries are from Brittany and Normandy, on the west side of France, where the other identified arms, and the coronet, seem to indicate an origin in the Low Countries. So there you have it. We've managed to identify two of the three shields on this memorial board. Unfortunately, the one so far been identified is the husband's arms, and that makes researching the rest of the family a lot more difficult. 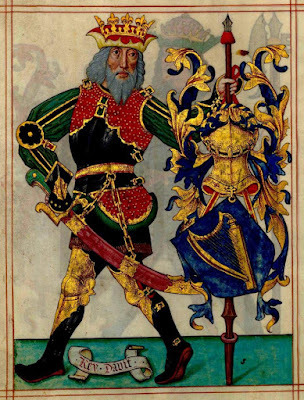 What little I've been able to find on de Draeck women has them marrying men who bear different coats of arms from the one here. 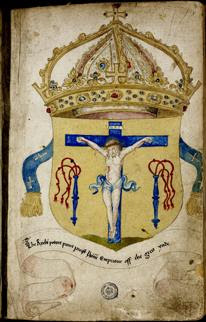 So if you think you might know to whom these arms belong, I'd love to hear your thoughts, because I've gone just about as far as I can in identifying them, and I'd really like to know more. And, of course, if you have the room at your place (and a few thousand dollars laying about the house just waiting to be spent) for this memorial board, let me know and I'll tell you where this heraldic gem is currently hanging out and waiting for the right buyer to come along. Parked outside Dumfries House while we were visiting there was a passenger van emblazoned with two different badges. consisting of a type of breast star often used by knightly orders (here, a style often seen on breast stars of the Order of the Thistle), with the initials D and H (for Dumfries House, obviously) and surmounted in chief by a very exuberant thistle (hello, Scotland). The badge is an interesting, somewhat modernized take on traditional Islamic design, and consists of a voided octagon interlaced with a series of eight loops, pointed and arranged to create an eight-pointed star in the center. Both badges were interesting, especially when juxtaposed onto a single item (the van) as they were. Above the main entrance to Dumfries House, atop the pediment with the achievement of arms that I discussed in my last post, is a flagpole with the Dumfries House Flag. A sign nearby entitled "Dumfries House Flag Protocol" discusses the three flags which are flown at various times by the House. Of the other two, one is the Standard for Scotland of Prince Charles, Duke of Rothesay, and is flown whenever he is in residence at the House. The third is the Union Flag (I appreciate them not calling it the "Union Jack") which is flown on certain birthdays. [The Dumfries House Flag] incorporates the Coat of Arms granted to the Great Steward of Scotland's Dumfries House Trust in 2015. The Arms contain reference to those principally involve in the evolution of the estate. 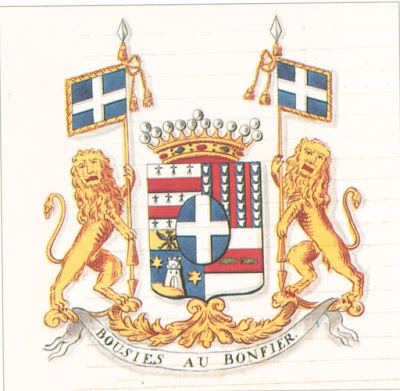 The two blue lions on white background come from the Crichton Arms and commemorate the original purchase of the estate by William Crichton, 1st Earl of Dumfries, in 1635. The two red lions allude to the Royal Arms of Scotland and the intervention of the Duke of Rothesay to save the house. The black saltire and gold lozenge allude to the Arms of William Crichton-Dalrymple, 5th Earl of Dumfries, who commissioned the Adam brothers to build the house. 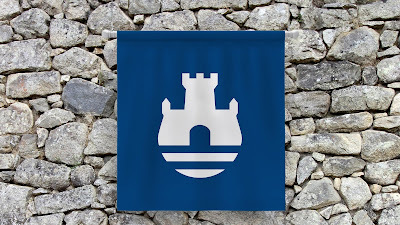 I'm not certain why the House flag was give a black saltire instead of a blue one; of all of the Dalrymple arms that I can find with this motif, it is always a saltire azure. Be that as it may, there you have it, a whole lot of history all wrapped up into a single heraldic flag, flying proudly above the Dumfries House in Ayrshire. The next stop on our heraldic tour of Scotland was Dumfries House in Ayrshire. Alas, I'm not going to be able to share with any but a very little of the heraldry we saw there, as the House is owned by the National Trust and does not allow photographs to be taken inside. Still, I'll do what I can. William Dalrymple-Crichton, 5th Earl of Dumfries KT (1699-1768) inherited the title of Earl of Dumfries in 1742, upon the death of his mother Penelope Crichton, 4th Countess of Dumfries. He commissioned Robert Adam, and John Adam to build Dumfries House, which was completed between 1754 and 1759. Naturally, as the home of a Scottish peer, there is an impressive achievement of arms displayed on the pediment over the main entrance. You should click on the image above to go to the large-size picture, so as to see all of the detail involved in this display of heraldry. The arms are: Quarterly: 1 and 4, Argent a lion rampant azure armed and langued gules (Crichton); 2, Or on a saltire azure nine lozenges or (Dalrymple); 3, Azure three water bougets or (Crichton). The arms are surrounded by the collar of the Order of the Thistle and surmounted by the coronet of an Earl. The supporters are: Two lions rampant crowned. Motto: God send grace (Creighton, per Fairbairn’s Crests). The circle on the left (dexter) is the star of the Order of the Thistle within a ribband of the order and surmounted by the coronet of an Earl, while the one on the right is the crest (A wyvern statant breathing flames wings addorsed) within a ribband of the order and surmounted by the coronet of an Earl. But I digress. To return to the pediment: the foliage on each side of the central achievement and on both ends is a combination of roses and thistles, slipped and leaved. I'm pretty sure they wanted to make sure that everyone knew whose house this was, so as not to get it confused with any of the other great houses in the county. Or as a way of marking their territory. 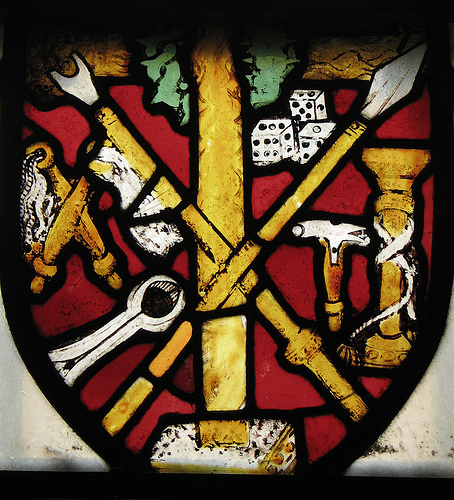 It is, in any case, as Charles Burnett and Mark Dennis put it so well in their book Scotland's Heraldic Heritage: The Lion Rejoicing, "an exuberant union of family, art and history."